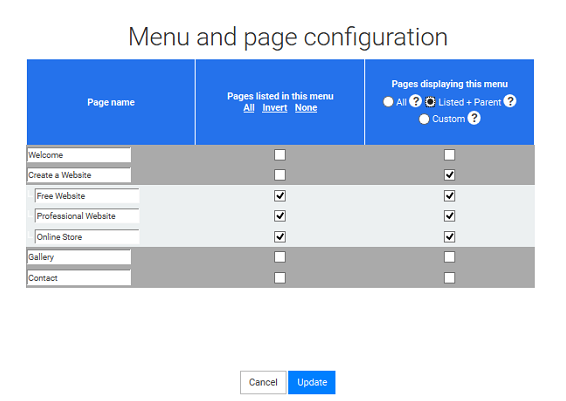 The Menu block allows you to automatically create menus listing all your website pages. In this tutorial, you will discover how you can create a main menu and submenus, allowing you to add more content while keeping your site organized. The page "Create a website" has 3 subpages "Free website", "Profesional website" et "Online store". The main menu, in order to keep it clear and simple, will only contain the 1, 2, 3 et 4 : "Home", "Create a website", "Gallery" and "Contact". The "Create a website" page will contain a submenu which will allow visitors to go to the subpages : "Free website", "Profesional website" and "Online store". The first step is to create 7 pages. Please note that Starter package website can only create 5 pages. Upgrade your website to be able to create an unlimited number of pages. Then, click on the Menu again, then on Manage pages. You can switch from page to page by pressing the Tab key. Check the boxes in the column "Page listed..." to select all the pages except "Free website", "Profesional website" and "Online store"
Then, go to the page "Free website"
Select "Listed + parent" in the column "Page dislaying this menu"
The main menu now lists all your first level pages and a submenu shows your subpages. 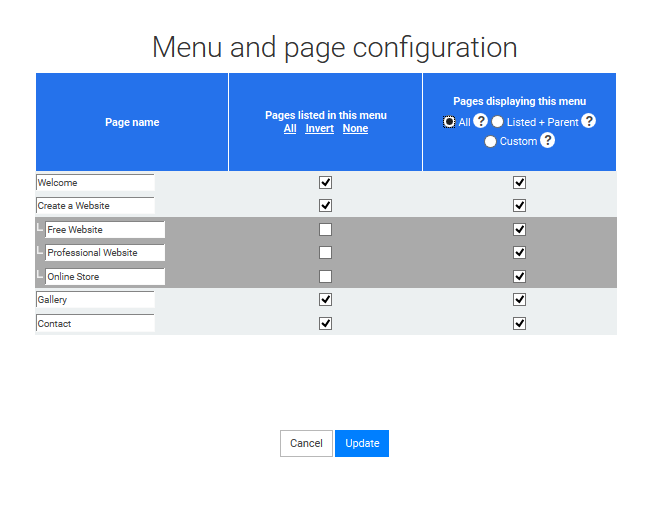 This menu is displayed on all the subpages and on the page "Create a website". You can also make the main menu unclickable, if needed. To do so, just check the proper case in the Design panel.